ThemeParkMama: Celebrate #Halloween with Oriental Trading! This year we decided to throw a Pre-Halloween Party, since most of the friends & family had kids in which they were trick or treating with on Halloween. I am was so excited to check out all the fun Halloween products from Oriental Trading. I decided to do a Peanuts theme party. I seriously was able to get everything in one spot and have it sent to my home within days of ordering! Here are some of the fun things I got for the party! Printed with Snoopy, Linus, Charlie Brown and more of your favorite characters, these Peanuts™ Halloween Paper Lanterns are the perfect addition to your Peanuts-themed Halloween party! 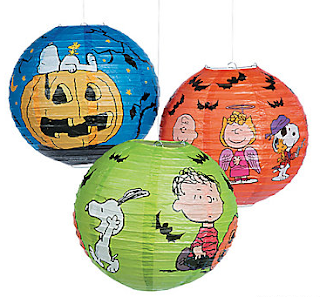 Easy to hang, these paper lanterns will match perfectly with the rest of our Peanuts Halloween decorations, sold separately on this website. (6 pcs. per set) 12" diam. Simple assembly required. Includes metal hangers. Only at OTC / © Peanuts Worldwide LLC I was shocked how easy they were to put together and hang. My kids as well as guest liked to tap them with their hands because the sound they would make. They also held up really great! The lanterns are something I will continue to order from Oriental Trading for every party. Mini Strobe Light. Point this strobe light at a mirror ball for added effect! It's a party essential for your dance floor. 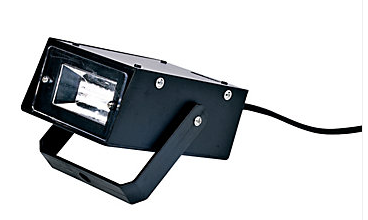 This 5" plastic mini strobe features variable flash speed, a hanging bracket and a 69" cord. UL listed. So this is great for any party, and what is really great about it, is you can take it anywhere! Put it together and hang it up as part of your Halloween decorations! 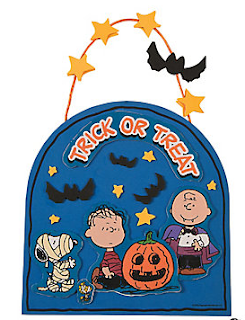 Each sign features Linus, Woodstock, Snoopy and Charlie Brown ready for Halloween! Includes self-adhesive foam shapes and satin cord for hanging. 7 1/2" x 8" Makes 12. All craft kit pieces are pre-packaged for individual use. Kits include instructions and extra pieces. Only at OTC / © 2015 Peanuts Worldwide LLC. My daughter is going through a major craft loving stage, so I figured this would be great for her and something to do for the younger kids. The kids had a blast doing this craft and enjoyed taking them home. These are just a few of the many things in which you can make your Halloween Party, Decor etc one to remember! I had so much fun doing our pre-Halloween Party, this year that I might make it a new family tradition! You can check out the whole line of Halloween themed items by visiting Oriental Trading here. Don't forget that not only is Oriental Trading a great place to get your Halloween decor but you can also purchase your costumes, and other Holiday, Birthday items and endless possibilities at Oriental Trading.